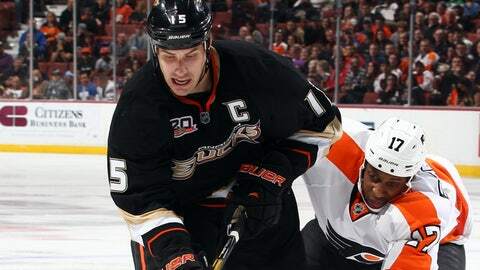 The Ducks' Ryan Getzlaf had a busy night against the Flyers. Ryan Getzlaf has been shooting the puck more this season, and it’s been paying off for himself and his teammates. "If he shoots the puck, he’s going to score. And he shoots the puck a lot — a lot more than he’s done in the past. So consequently, he’s getting goals," coach Bruce Boudreau said in reference to Getzlaf’s 136 shots on net. The Ducks’ captain also recorded his second career "Gordie Howe hat trick" — a goal, an assist, and a fight with Steve Downie. "He said to me earlier that I owed him one from that first game of the season when we fought and he was with Colorado," Getzlaf said. "So he asked me to go, and I thought it an OK time for me to do it." Winnik gave Anaheim a 4-2 lead with a short-handed goal, the ninth allowed this season by the Flyers — tying Edmonton for the league lead. "The way they play on the power play, they get four guys down below the hash marks after a shot," Winnik said after his first goal since Oct. 10. "It was something we knew going into the game, so we felt there could be chances that way and we were fortunate to get one tonight. It felt really good. It was a long time coming. It’s nice to get that pressure off me." "Our depth at goaltending has been outstanding, and when Freddie’s played he’s been unbelievable," Getzlaf said. "He’s a big kid and for a young guy, he plays really calm in the net. He’s not too active, and that’s a good sign. He’s a goalie that settles things down back there." "It was a pretty physical game," Boudreau said. "They were trying to push us around, but I thought we did a pretty good job of standing up for ourselves." "There wasn’t a single clean shot from the point the entire night," Mason said. "They did a great job of getting sticks on it, bodies in front. When you have a team like that, it makes it difficult to stop pucks. We controlled a lot of the play, but they were able to get two deflections in there. For the most part, we did a pretty good job."